An incomplete copper-alloy medieval enamelled harness pendant, dating to the period c. AD 1300-1400. The pendant itself is complete apart from a small break in the loop of the pendant, however much of the enamel is missing with only the blue enamel used to colour the background remaining. The pendant measures 29.44mm in length including the loop, 22.46mm wide and 1.90mm thick. It weighs 5.26 grams. It is quatrefoil shaped with the loop roughly centred in the middle of the top foil. The pendant features a central zoomorphic design, depicted using inlaid enamel. It depicts a stylised hare-riding-hound motif with the pair riding left. The face and paws of the "hound" are quite clear however the humanoid figure of the hare is relatively obscured, but the backwards pointing ears can be made out. 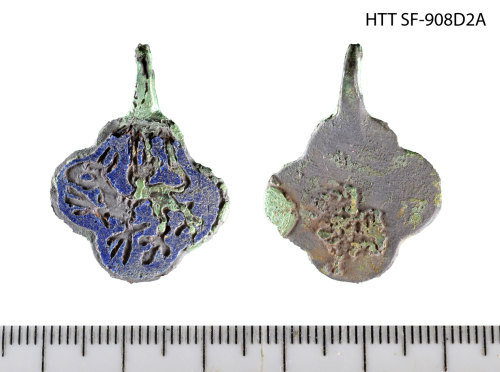 There are very few parallels for this pendant, but a two others do appear on the PAS database: HAMP-1DCE2C (https://finds.org.uk/database/artefacts/record/id/781073) and PUBLIC-EA1601 (https://finds.org.uk/database/artefacts/record/id/926644). This motif has also been known to appear on seal matrices.